On October 1st, 2011 more than 2,500 protesters marched across the Brooklyn Bridge. Of those 2,500 protesters from the Occupy Wall Street (now sometimes called OWS) demonstration, more than seven hundred protesters were arrested by the police while trying to cross the Brooklyn Bridge. Police defend their actions of arresting the protesters by saying the marchers’ actions led to the intervention. Only those who were walking in the road portion of the bridge were arrested while those who used the Brooklyn Bridge walkway were not arrested. The protesters who were walking in the street portion of the bridge were arrested due to the laws that were enacted to ensure reasonable time, place, and manner restrictions on protests to prevent any unsafe conditions for the public. By choosing to march in the street, demonstrators were creating a public safety hazard while also impeding the flow of traffic across the bridge. The New York Police Department had warned protesters in the days preceding October 1st arrests. The police department had issues several warnings to the protesters that walking in the roadway instead of on the pedestrian walkway, would lead to arrests of those who did not abide by the law. Many of those who were arrested have since been released with a summons. In the weeks since it began, the OWS protests have become violent. Over a dozen New York Police Department officers have been injured in protest related incidents including five officers who were sent to a hospital for injuries including hand and ankle injuries, and at least one head trauma injury. Injuries were sustained at events including marches in Times Square on Oct. 15, and on Oct. 14 when OWS protesters marched down Broadway from Zuccotti Park toward the New York Stock Exchange in a celebration of the postponing of the cleaning of the park by the owners – Brookfield Properties. First Precinct Commander Edward Winski suffered an elbow injury after a protester fought with a deputy inspector while being arrested because they refused to move from the street to the sidewalk. The protester was charged with resisting arrest, obstructing government administration, and criminal mischief. 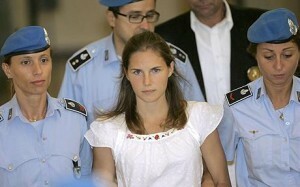 Knox was convicted of murder in the 2007 death of her roommate – Meredith Kercher. Knox had been sentenced to 26 years in prison. Knox said she wanted the Kercher family to be remembered. While the appeals court exonerated Knox of the most serious charges, the court upheld her conviction on the charge of defamation against Patrick Lumumba, based on Knox accusing him of killing Kercher. She was sentenced to three years in prison, which she has already served. Kercher’s body was found partly naked, with more than 40 stab wounds and a deep gash in her throat, in the flat she was a roommate with Knox in Perugia where they were studying. The Italian prosecutors announced they intend to appeal Knox’s case to Italy’s highest appellate court. If Italy’s highest court – the Corte Suprema – rules in the prosecutor’s favor, it could reinstate the murder charge against Knox. Italy then could seek her extradition from the United States to be sentenced. Knox was a popular girl in Seattle before she went to Italy. She had won her school’s highest award – the Manvel Schauffler Award – named after a founder of the school. Candace Dempsey – a Seattle-based author of one of about a dozen books that have been written about the Knox case, said “She has earning power now that she is free. . . . She can write a book and she can certainly help her family pay back the bills” they incurred in her defense, and on their prolonged visits to Italy.